On the 1st Missionary Journey, the Apostle Paul accompanied by Barnabas first preached in Salamis on the island of Cyprus: “So, being sent out by the Holy Spirit, they went down to Seleucia and from there they sailed to Cyprus. When they reached Salamis, they began to proclaim the word of God in the synagogues of the Jews; and they also had John as their helper” (Acts 13:4,5). 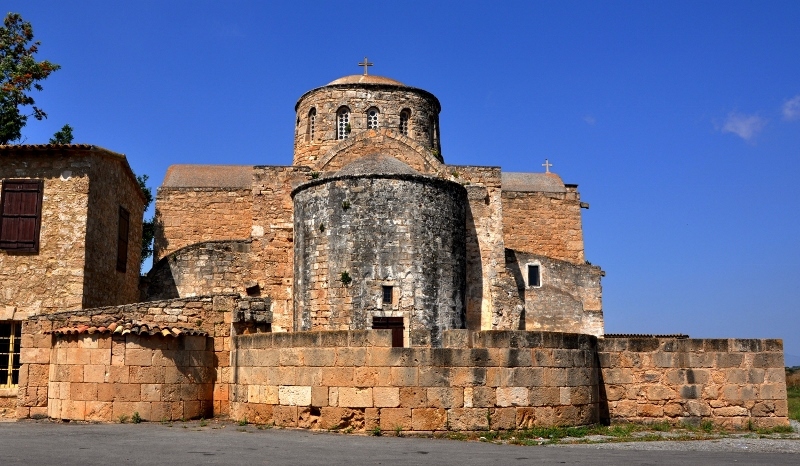 Our photo shows the “Monastery of St. Barnabas,” at Salamis, Cyprus. While the monastery itself is not a “biblical site” its presence bears testimony to the fact that Barnabas was indeed here. Salamis, Cyprus. Monastery of St. Barnabas. Photo by Leon Mauldin. This monastery dedicated to St. Barnabas at Salamis, Cyprus, marks the first stop on Paul’s initial missionary journey. The earliest buildings of the monastery date to 477 C.E. Perhaps Paul and Barnabas went first to Cyrus because it was Barnabas’s homeland (Acts 4:36), perhaps also because the island is large and strategically located. Cyprus served as a stepping stone on the trade routes that crossed the eastern Mediterranean. Archaeological remains from as early as the Early Bronze Age (3rd millennium B.C.E.) show it to have been a cultural meeting ground and “melting pot” for the successive cultures that flourished on all sides of it. Salamis was the main port and principal city of the island in the Roman age. Located about five miles north of modern Famagusta, on its great bay, the city has yielded extensive Roman remains, including a theater, gymnasium, baths and a forum. Paul’s visit to Salamis established a pattern for his missionary strategy that would continue through the rest of his travels. Heading for the major city of the region, Paul went immediately to proclaim the new “word of God” in the Jewish synagogues (Acts 13:5). We know from literary accounts that Jews settled in Salamis at least as early as the 3rd century B.C.E., and at such a flourishing city there undoubtedly would have been several synagogue communities. (BAS Biblical World in Pictures, 2003). See our previous article on the theater in Salamis here. This entry was posted on Friday, October 2nd, 2015 at 10:15 PM and is filed under Bible History and Geography, Bible Study, Greece, Greek Islands, New Testament, photography, Salamis, Travel. You can follow any responses to this entry through the RSS 2.0 feed. You can leave a response, or trackback from your own site.